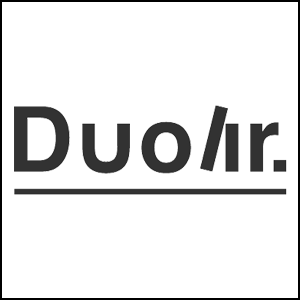 Duolir offers language improvement through the creativity of native speakers. Duolir is one of the most innovative language-learning apps available in the iOS store. If you’ve ever attempted to read a book in a second language, especially a language that you may not yet have perfected, you’re familiar with the frustration of not fully understanding everything. Even though reading a book can be one of the best ways to master a new language, it can also be an incredibly arduous process. Duolir uses literature to advance your understanding of a particular language, offering instant translation as you read along. The app essentially contains books, each written in two languages. To alternate languages from paragraph to paragraph, all you have to do is tap. Duolir sells itself by claiming that its stories are immersive, encouraging learners to keep reading so that they can pick up on the language without necessarily even knowing that they’re studying in the process. It is true that a poetic way of phrasing something in a writer’s native language is much more engaging than the boring sentences that can be found in most textbooks. 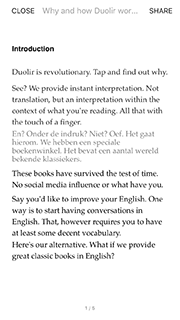 Duolir has many books available on its platform, in languages from Chinese to Dutch to Spanish and Tagalog. 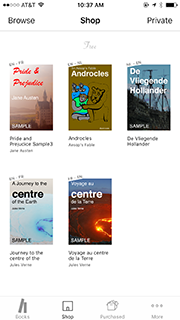 Several of the books are free, although many others are only available for purchase. But even if you have to buy a book on Duolir in order to read it in your language of choice, it’s worth the effort to further your understanding of the language in a captivating manner.